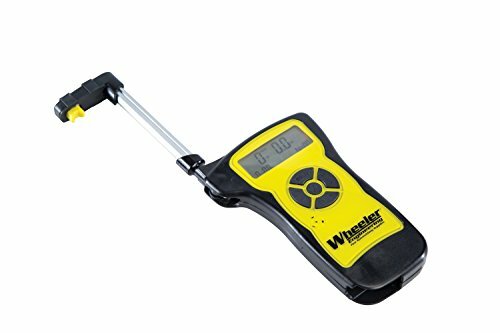 Wheeler professional digital trigger gauge features an over molded design and soft touch buttons for comfort and a consistent line of pull. The load cell directly contacts the trigger making it the most accurate trigger gauge available. It has a range of 0-12lbs with an accuracy rating of +/-.1oz. It has multiple functions such as max, Min, average and live weight. The visual low battery indicator and audible indicator make it easy to know what's going on. The arm holding the load cell swings into the housing for storage to protect the load cell and to fit in the heavy duty injection molded storage case. High precision and high resolution. Five testing modes and three display methods for selection N (Newton), kg (Kilogram) and Ib (Pound) three measuring units for selection and conversion. 6 digits large screen display. Max. and min. and comparison value can be setted for statistic analysis. Data storage function. 896 testing values can be stored. Data output function. The data can be input into computer through data line for various analyses. Printer function:this function can print the stored data through computer by USB. 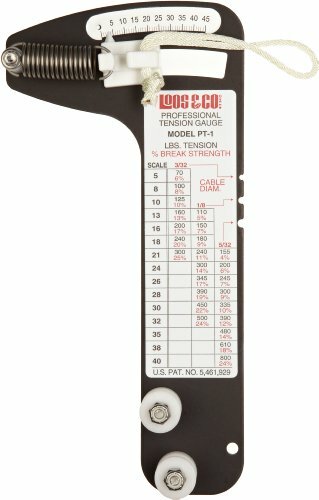 The Loos Cableware inch tension gauge measures the tension in cables to check for proper setup in sail rigging and supporting cables for large tents, radio towers, and other structures. This analog gauge shows present tension in pounds (lb.) and has a measurement accuracy of + or - 5 percent. 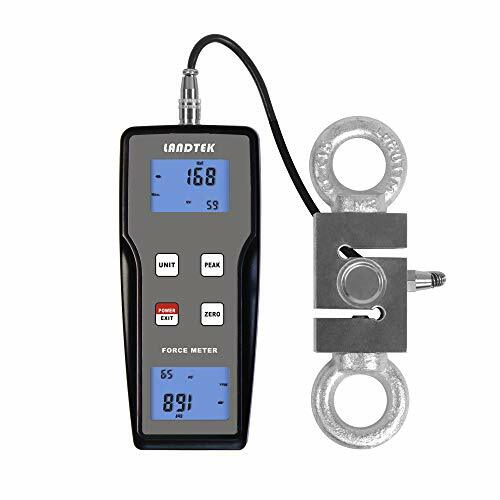 The gauge shows readings on a graduated scale, and a calibration table on the unit converts a scale reading to the corresponding present tension and percentage breaking strength of the rope, based on 302/304 1 x 19 stainless-steel wire rope. The gauge can remain hooked on the wire during testing while the tension is adjusted. 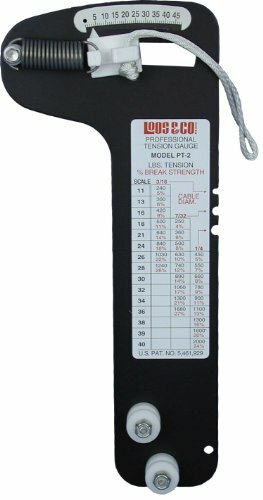 The Loos Cableware metric tension gauge has an anodized aluminum body that resists corrosion and wear. A 1/4" hole on the gauge's body allows a lanyard or hook to be attached to the gauge for securing it to the cable. Force gauges, also called push-pull gauges or tension gauges, measure the tensile (pull) or compression (push) force applied to an object. They are used to test the strength and functionality of a variety of machines, electronic components, cables, wires, and consumer products in scientific, medical, automotive, quality assurance, and manufacturing applications. A digital force gauge shows the amount of force in digits on the gauge's display. 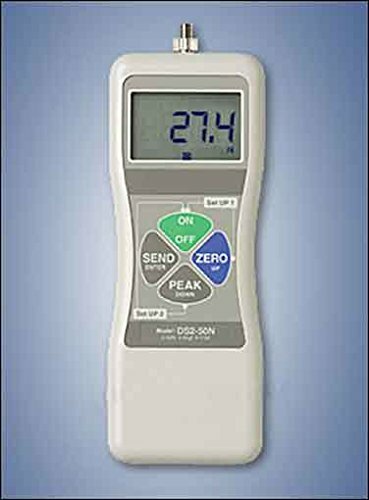 Response time varies among digital force gauges depending on the speed of the processor. An analog (or mechanical) force gauge shows measurements on a calibrated dial. Analog force gauges are not as precise as digital force gauges, but they provide instantaneous measurements and can be used in a wider range of environmental conditions than digital force gauges. Hooks, compression plates, levers, handles, test stands, and other accessories can be used with the gauge for taking measurements on objects with a range of shapes and sizes. Loos & Co. manufactures aircraft cable and wire rope and related measurement tools. The company, founded in 1958 and headquartered in Pomfret, CT, meets International Organization for Standardization (ISO) standard 9001. Accuracy 0.2% or better of FS (Full Capacity). Tension or Compression Load. Peak Hold or Track Mode. 500 reading can be recorded on internal memory for later viewing or download. Metal Enclosures with 2x 10-32"(M5) & 4x M3 mountable threaded holes. M6 Threaded Rod attachment to Load. Menu driven, digital graphic LCD display with white back light. Latest version PC Software 'NexGraph' Plot Time vs Force, free downloadable from our web site www.forcetorque.com Power by internal rechargeable NiMH battery pack or directly from wall plug charger. Complete set include plastic case, charger, USB cable, printed manual, 3 brass plated accessories (sharp point, hook & compression plate). Calibration Certificate included. 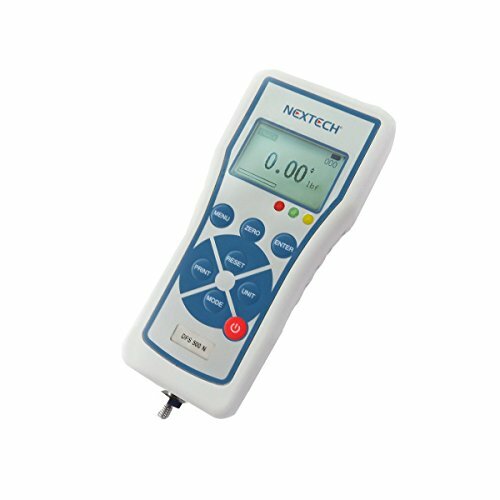 Brand: Nextech | Manufacturer: Nextech Global Company Limted. 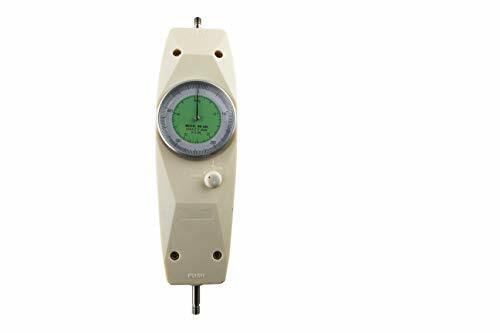 The Loos Cableware inch tension gauge measures the tension in cables and rods to check for proper setup in sail rigging and supporting cables for large tents, radio towers, and other structures. This analog gauge shows present tension in pounds (lb.) and has a measurement accuracy of + or - 5 percent. 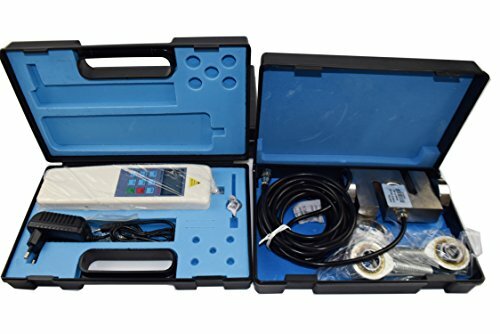 The gauge shows readings on a graduated scale, and a calibration table on the unit converts a scale reading to the corresponding present tension and percentage breaking strength of the rope, based on 302/304 1 x 19 stainless-steel wire rope. The gauge can remain hooked on the wire during testing while the tension is adjusted. The Loos Cableware metric tension gauge has an anodized aluminum body that resists corrosion and wear. A 1/4" hole on the gauge's body allows a lanyard or hook to be attached to the gauge for securing it to the cable. * High accuracy and high resolution. * Digital display with no guessing or errors. * With 3 measurement unit for selection and conversion, N, kg, lb. * With peak value hold function. * With 10 minutes auto power off and manual power off. * Power can be supplied by either alkaline battery or 6V DC power. High accuracy and high resolution. Digital display with no guessing or errors. With peak value hold function. With 10 minutes auto power off and manual power off. 8)In storage 800sets measuring data, and automatic calculate storage data average, max, min value. 9)Accessories: Pull clamps / Push clamp / Prolong stick / Mounting screws / english user manual / Carrying case / 110 to 220V Battery charger / PC software and serial interface cable. 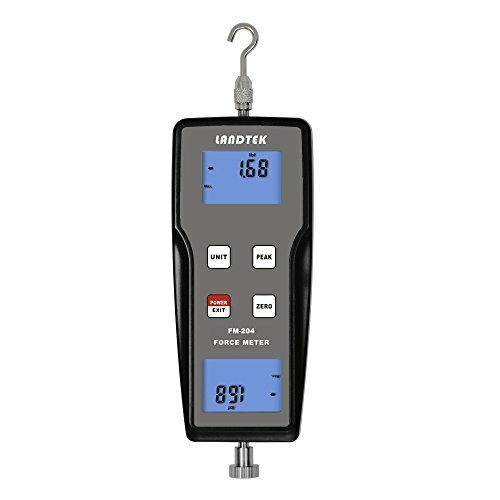 The Shimpo FGE-X DART series digital force gauge with liquid crystal display (LCD) measures compression (push) and tensile (pull) forces in quality control and process control applications. The LCD shows either present force measured in real time or the maximum positive or negative peak force measured over the course of a test. It has a measurement accuracy of + or - 0.2 percent of full scale. The gauge has a 1,000-hertz (Hz) sampling rate and updates measurements 1,000 times per second. The gauge can withstand an overload of up to 200 percent of full-scale capacity. The reversible LCD and keypad provide readability when the gauge is held upside down. The user can adjust the speed at which the display refreshes, for readability. A tracking function adjusts measurements to account for changes in ambient temperature and humidity, which can impact measurement accuracy. 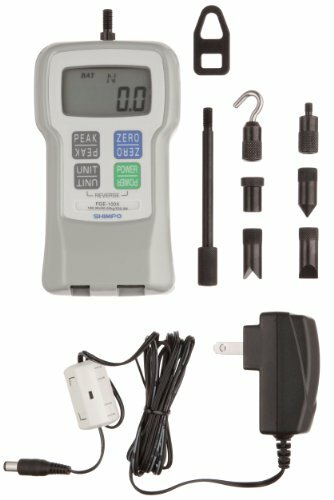 The zero function clears a reading on the display and zeroes the meter before measurement for improved accuracy. The display can be set to show compressive force as positive and tensile force as negative, or the other way around. The gauge can be held in one hand during use, or it can be mounted on a compatible stand (not included) for hands-free operation. 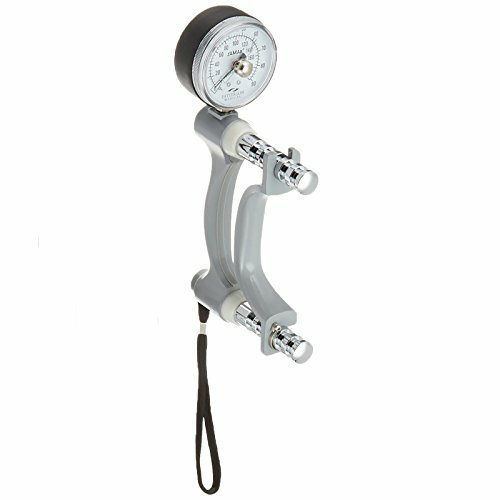 A removable hanger allows the gauge to be suspended from a hook or fixture. 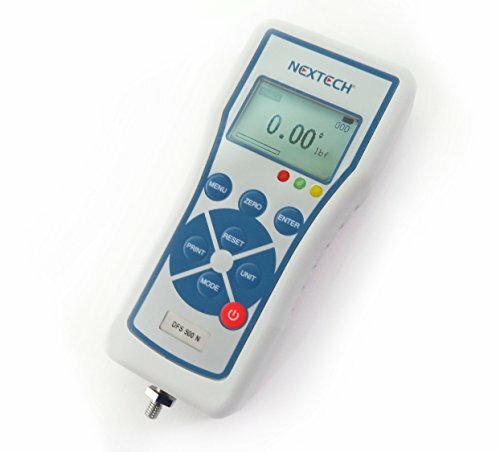 The gauge comes with one hook, one chisel, one flat head, one notched head, and one cone head sensor attachment that screw onto the sensor shaft for conducting tests on a variety of devices. It also comes with an extension rod for increasing the reach of the gauge's sensor. The unit accepts metric-threaded attachments and comes with a thread adapter for use with attachments that have English thread. The unit's calibration function helps maintain accuracy of measurements. The gauge's body is constructed from die-cast aluminum, which resists wear. The unit automatically shuts off after 10 minutes of non-use to conserve battery life, and a low-battery indicator shows when batteries need to be charged. The gauge operates on one rechargeable nickel-cadmium (Ni-Cad) battery (installed), and it comes with an AC/DC power adapter that charges the battery and provides a back-up power source for the gauge. Kit Contents: All DS2 gauges are sold in a complete kit with gauge, hard plastic carrying case, a set of six measuring adapters and AC adapter/charger. Analog Push Pull Gauge with compact size and high accuracy. They are easy to operate and handy. Single click on a knob on the device will convert the movement of the indication needle from the peak force indication (the needle stands still indicating peak force) to the tracking indication(the needle moves in accordance with change of force) . As two types of scales (Newton scale and kilogram scale) are available and you can choose the most suitable graduation from the range of 10N(1kgf) to 500N(50kgf) for your measurement purpose. Simultaneous display of two scales without any shift of measurement conversion. Peak value maintenance and load capacity real-time display can be flexibley shifted. The digital force gauge is a kind of simple and convenient multi-functional instrument for high-accuracy push force and pull force test. It is widely used in electronics, building hardware, etc. (1)Digital display with back light gives exact and clearly reading although you stay at the somber conditions. (2)High accuracy 0.5%FS 1 Digitand high resolution 0.01 kgf ( <100 kgf ), 0.1 kgf ( 100 kgf ); 0.01 N ( <1000N ), 1 N ( 1000 N ); 0.1 Lbf ( < 1000 Lbf ), 1Lbf ( 1000 Lbf ).Force Measurement Range: 1000 kgf; 9800 N; 2200 Lbf. (3)With 3 measurement unit for selection and conversion, N, kg, lb. (4)With peak value hold function.Easy operation and good stability,less power consumption.10 minutes auto power off and manual power off. 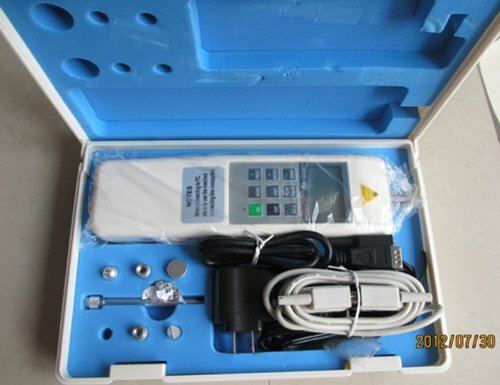 (5)The digital force gauge is a kind of simple and convenient multi-functional instrument for high-accuracy push force and pull force test. It is widely used in electronics, building hardware, etc. Easy operation and can be installed on all testing tables. Pointer style makes figure-reading easy and precise. Simultaneous Display: Dual display two units of Kilogram & Newtons, no unit conversion. Peak&Track Test: Switch freely between load peak (PEAK) test and continuous load value (TRACK) test. Easy To Read: Pointer indication for easy and accurate reading. An alternative to the old-fashioned tube-type push-pull force gauge. Simple Operation: Hand-held use or can be mounted on all types of work bench. Its Rugged construction and excellent accuracy make it ideal for Push/Pull measurements under any circumstances. Wide Uses: Widely used for tension and compression load, plug force, destructive test in electronics, high and low voltage electrical appliances, hardware locks, auto parts, viscose chemical industry, lighters and ignition devices, pens, light industry, construction, textile, machinery and other industries and research institutions. 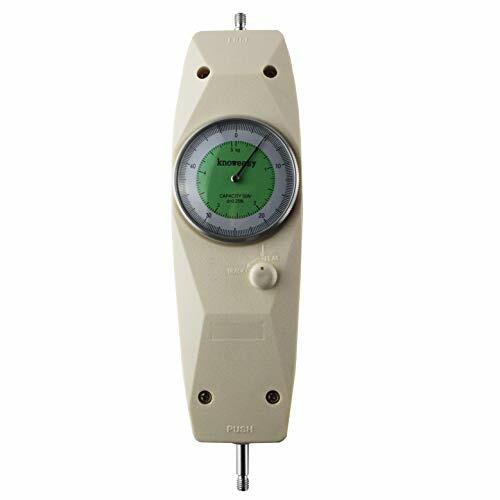 Introduction: The digital force gauge is a kind of simple and convenient functional instrument for high-accuracy push force and pull force test.It is widely used in electronics,building hardware,textile,auto parts. Features: * High accuracy and high resolution. * Digital display with no guessing or errors. * With 3 measurement unit for selection and conversion, N, kg, lb. * With peak value hold function. * With 10 minutes auto power off and manual power off. * Either alkaline battery Power supply or 6V DC power. With 3 measurement unit for selection and conversion, N, kg, lb.